By Scott Puritz on October 20, 2016 in Index Funds & ETFs. In his recent column highlighting the many benefits indexing offers the common investor, Wall Street Journal contributor Spencer Jakab featured Rebalance Investment Committee members Charley Ellis and Burt Malkiel’s celebrated views on the investment phenomenon. Jakab makes the case for indexing by not only showcasing the “higher quality for lower cost” appeal of index investing, but also the renowned voices that have leveraged decades of experience in the industry to endorse this method of investing. Read the article in full for more information on the myriad ways index investing can help you retire with more. By almost any measure—performance, inflows and certainly bang for the buck—passive funds for years have trounced active managers. But can the superior performance continue, or are there limits to their success? Passive investing amounts to tracking an index or formula as opposed to paying a human being to actively beat the market. The question of whether investors can continue to get more for less isn’t merely a case of grousing from beaten money managers. There are legitimate arguments against passive investing’s virtues and sustainability. Past performance, as they say, is no guarantee of future returns. Nor is there precedent for what happens when so much money is invested blindly according to a formula. After a slow start four decades ago when Vanguard Group’s John Bogle launched a passively managed S&P 500 index mutual fund, the genre now comprises almost 30% of mutual and exchange-traded funds, according to the Investment Company Institute, more than double their share a decade ago and eight times the share 20 years ago. Resounding success has a way of drowning out critics. Here are some of the arguments against passive investing—and their shortcomings. Indexes are a low-cost approach to investing, yet they can incur some costs and conundrums that active managers can avoid. 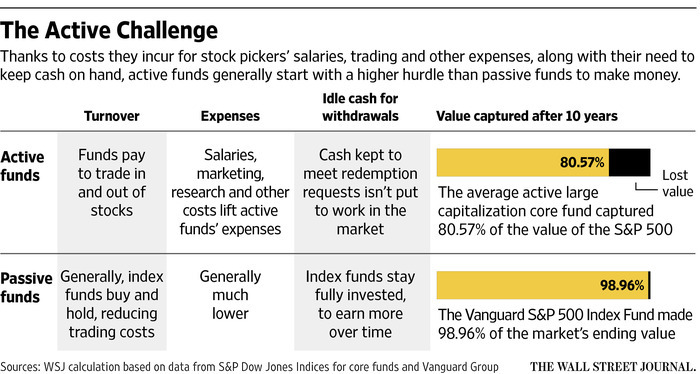 One concerns how and when the passive funds buy stocks. “The index” isn’t the same as “the market.” When it is announced that a stock will be added to the S&P 500, its price jumps before index investors have to buy it, and the price of the stock it replaces sinks before they sell it. These moves create a drag on returns that is invisible to passive investors since they conflate index performance with a passive market performance. Mr. Arnott’s analysis suggests the drag on returns could be half a percentage point or more a year. The problem with the argument, though, is that the drag is relative to “the market,” which no investment firm offers as a product. Another conundrum: Stocks in the index become overvalued relative to those outside it. Jeffrey Wurgler, a finance professor at New York University’s Stern School of Business, has seen signs of this by comparing similar stocks that are or aren’t included in a basket. A related criticism is that index investors have to ride the rise and fall of overvalued sectors within the index such as technology in the 1990s. They own more of what just went up and less of what just went down by default. Mr. Arnott’s firm has developed “fundamental indexes” designed to avoid this problem. But even as Messrs. Wurgler and Arnott say the distortions of traditional indexing are real and growing, they agree that the benefits far outweigh the costs for now compared with active funds. The explanation isn’t the elegant, Nobel Prize-winning Efficient Market Hypothesis but what Mr. Bogle calls the “Cost Matters Hypothesis.” Even if one assumes that a fund manager can match the market, all the direct and indirect costs of active management add up to over 2 percentage points a year, according to a study by economist William Sharpe. That makes up for plenty of inefficiency. Another knock on passive investing is that it gets a free ride on active managers’ stock analysis. If and when the shift in market share leads to a significant decline in active managers, there will be hardly any experts left to size up stocks, critics say. In turn, they won’t be valued correctly. Yet Charles Ellis, an intellectual godfather of the indexing phenomenon, points out that passive funds’ market share remains far from that theoretical level where there won’t be enough price discoverers. “I’m very confident that 60% isn’t enough or that 80% isn’t enough. 90% may be enough,” he says. Mr. Malkiel reckons that the threshold is even higher and that it won’t ever be breached anyway. Money management is so profitable, he says, that, if active investing re-emerges as a winner’s game because so few are competing at price discovery, it will attract enough new managers to compete themselves back into mediocrity. But then he isn’t a mutual-fund manager, and many studies have shown that actual investing skill, while it probably exists in some small percentage of managers in excess of their fees, only can be identified with hindsight. The odds of individual savers finding or being guided to such funds are low even before one accounts for the hefty drag of fund costs. Research has shown, for example, that simply choosing top-ranked funds from services such as Morningstar actually worsens the odds of picking a winner. This is akin to the Sports Illustrated cover curse and happens for a similar reason—reversion to the mean.